Morning bloggers! Kim here to share a card and a BIG word of thanks! Yesterday's re-launch was so much fun! I love the blog hop, all of the wonderful comments from friends and customers, and the excitement of seeing the new site live! A wonderful time and I am so thankful for my husband, children, design team, and customers who came out to hop and shop! We're looking forward to more amazing days in the store with new products and new adventures so be sure to check back to the blog often, like us on Facebook, and sign up to receive our newsletter. I also wanted to thank a few vendors that I worked with, who helped to make this launch possible. eCity Commerce - eCity went above and beyond in helping me with the new web site. To turn around a new site in three weeks was hugely challenging and eCity rocked!! I can't recommend them enough! Take Heart - Danielle is a wonderful designer (she is primarily a blog designer) and did a tremendous job on the blog, which was then translated in to the web design. Danielle also designed the new logo and other company related items. The eTeam - Seriously, could they be any more fantastic! Such beautiful artwork and they were all incredibly supportive leading up to the launch. It's a real treat to work and craft with these talented women. My husband, who has been amazingly supportive during this last month. Helping with dinner when I had been sitting at the computer for 12+ hours, watching the boys, encouraging me when I was feeling frazzled, and he happens to be the best shipping guy around. And my precious boys who helped me unpack and stock shelves, pack orders, and tell me things like "good job" when orders began to arrive. That they can offer support at their young age is so touching. Being able to work from home, and be with my boys when they're little, is a huge blessing and I'm grateful that I have this opportunity to make that happen with eP. 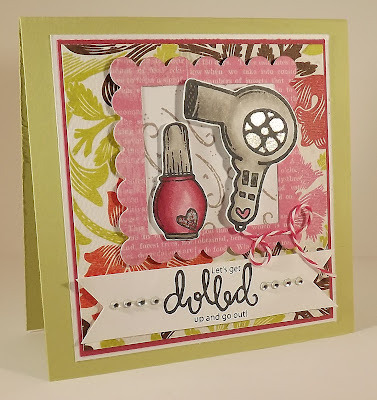 OK..so today's card...I confess that I haven't been crafting much yet it's my turn to post on the blog...hummmm (BTW, we're going to be posting every day on the blog so sign up to become a follower!! )....so I'm sharing an older DT project that features this beautiful paper from Authentique. This is from the Lively 6x6 paper pad. Love the colors in this pad...oh heck, I love everything from Authentique, they are definitely one of my favorite paper companies. I also used Pink Sorbet twine for the cord on the blow dryer and KasierCraft rhinestones as a little accent on either side of the sentiment. And the images are colored with Copics (did you see our new Copic marker pricing? But five, get one...FREE...this means that each marker is only $5.83 each!) And the stamps...I confess that I'm not carrying this particular set (but I'll get it if you want it!) but I have a bunch of other sets from Sweet Stamp Shop....check 'em out here! Enjoy today's card...check back tomorrow for more and THANK YOU all so much for your ongoing patronage!! SWEET card Kim. Love the fun and girly colors and images. The touch of blings look fab! 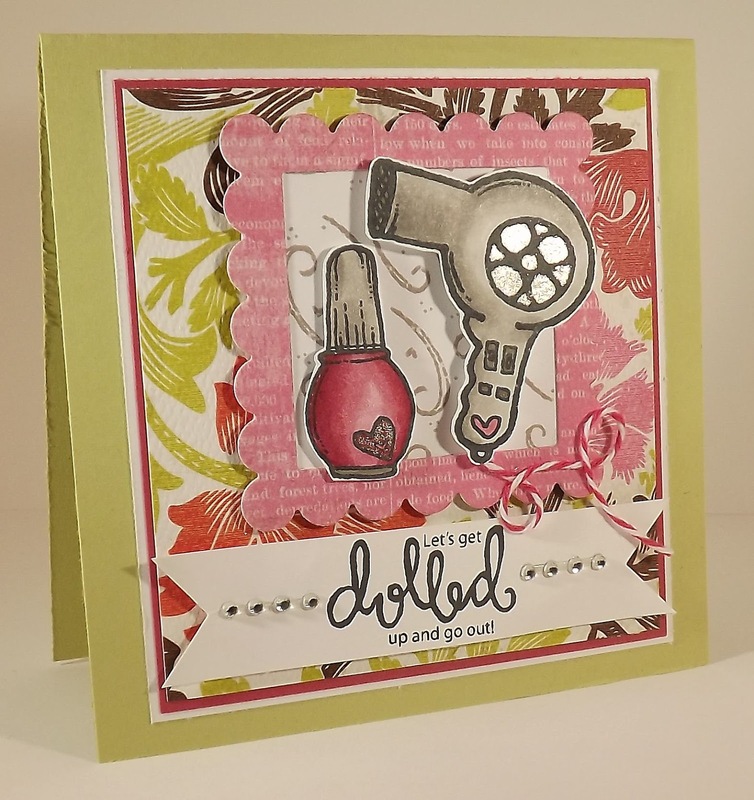 What a fun card and oh so girlie! The twine is perfect for the cord. Great inspiration! Totally adorable, Kim!! Love the colors and that image is so fun!! I'm just LOVING the mental picture of your boys helping you unpack shipments and saying "good job, Mommy!" at all the products! I'm honored to be "working" for you, Kim and can't wait for more adventure with eP!